The lightweight M48 Mountain Carbon is Nosler's latest addition to its lineup of high-performance hunting rifles. Nosler is probably best known for their bullets like the Partition, the AccuBond or the E-Tip. However, Nosler has been producing and selling high-quality custom rifles for several years now like the Nosler M48 Long Range Carbon and the Nosler M48 Liberty. Well, they just announced the newest addition to their lineup of rifles at SHOT Show 2019: the M48 Mountain Carbon. As you can probably tell from the name, the new M48 Mountain Carbon is designed for hunters who want a lightweight, but still accurate and rugged rifle that doesn't cost a fortune. With that in mind, the folks at Nosler took their standard M48 receiver and paired it with a custom aramid reinforced carbon fiber stock that's specifically made for the rifle for maximum weight savings. They then glass and aluminum pillar bed the action into the stock. The Mountain Carbon rifle uses a 24-inch free-floated, carbon-wrapped, match-grade barrel that features cut rifling for best accuracy. Equipped with a Timney Trigger and a two-position safety, Nosler even advertises a sub-MOA guarantee for the M48 Mountain Carbon rifle when hunters use the recommended ammunition. The barrel also has a 5/8x25 threaded muzzle for hunters who want to add a suppressor or a muzzle brake and will accept any standard two-piece scope base that would fit a Remington Model 700 rifle. Finally, Nosler coats the action and bottom metal surfaces on the rifle with a cerakote finish for maximum durability and weather resistance. When all is said and done, the M48 Mountain Carbon is well balanced and has a sub-6-pound overall weight. This is is a great combination of being light enough to carry on a mountain hunting expedition, but still heavy enough to be a good shooting platform at the moment of truth. Keep in mind that while it's indeed very accurate, Nosler didn't design the Mountain Carbon for long-range competition shooting. This high-end hunting rifle is an excellent choice for hunting in rugged terrain where a lightweight, easy-to-carry rifle is essential. 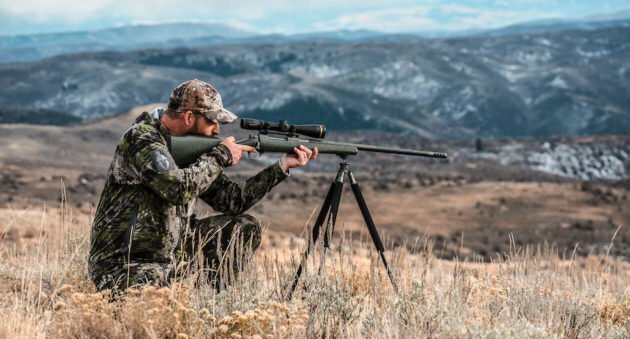 Designed with North American hunters in mind, Nosler is initially offering the Model 48 Mountain Carbon in 6mm Creedmoor, 6.5mm Creedmoor, 26 Nosler, 28 Nosler, .300 Winchester Magnum, 30 Nosler and 33 Nosler. M48 Mountain Carbon rifles chambered in 6mm Creedmoor and 6.5mm Creedmoor have an overall length of 44.5 inches and a four-round magazine capacity. All other calibers have an overall length of 45 inches and a three-round magazine capacity. Nosler produces all the M48 Mountain Carbon rifles by hand at the Nosler manufacturing facility in Bend, Oregon. There are certainly lighter rifles out there, but the Nosler M48 Mountain Carbon offers an excellent combination of high performance in a lightweight package at a reasonable price point compared to other ultra-lightweight rifles on the market (MSRP of $3,140). For more information on this new rifle, visit Nosler.com. Like what you see here? Check out John McAdams on his hunting blog. Learn more about the New Zealand Hunting packages Big Game Hunting Adventures offers on their web site or follow them on Facebook, YouTube, & Instagram.